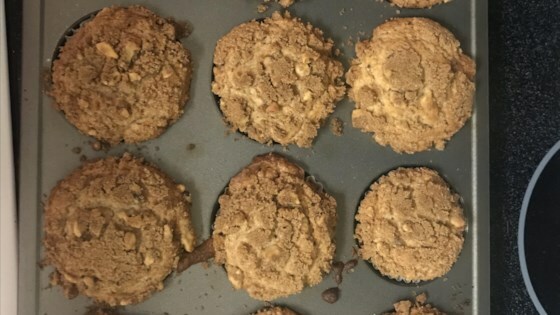 "These homemade muffins with a cinnamon-flavored streusel topping are great for brunch or with coffee." Fill cups 2/3 full. In small bowl, blend 1/4 cup firmly packed brown sugar, 1 tablespoon butter (softened), 1/2 teaspoon cinnamon and 1/4 cup chopped nuts or flaked coconut with fork until crumbly. Sprinkle over muffins before baking. Make a morning muffin that’s loaded with good stuff. I thought that this recipe would be great because of the star rating. I found the muffins to be extrememly bland, the dough had a pizza dough consistency. The topping burned. Terrible!!! Tasted Pretty good but the topping even after adding flour to the mixture made a HUGE mess..I think i would wait 10 minutes into cooking time to add the topping next time.